A daily cleaning routine is a busy person’s best friend. See, here’s the thing about cleaning house: the more often you do it, the less you have to do. That’s why it’s a good idea to have a quick, daily cleaning routine that will keep your house looking beautiful all the time. Use the printable house cleaning checklist (below) as your daily routine, and you’ll start every day off right. Even though I’m providing a pretty printable, it’s a good idea to review all of the steps, so you’re familiar with them. Once you’ve done that, consider slipping the printable into a plastic page protector and hanging it on the refrigerator or in a kitchen cupboard. Use a dry erase marker to check steps off as you go, and wipe it clean when you’re done so it’s ready for the next day! I’m not going to lie: if you haven’t been in the habit of cleaning or even tidying every day, it may take you an hour or longer the first time you go through this list. But I promise the next day things will go faster and, after several days of following the Daily Cleaning Routine you’ll be able to do it in fewer than 20 minutes. 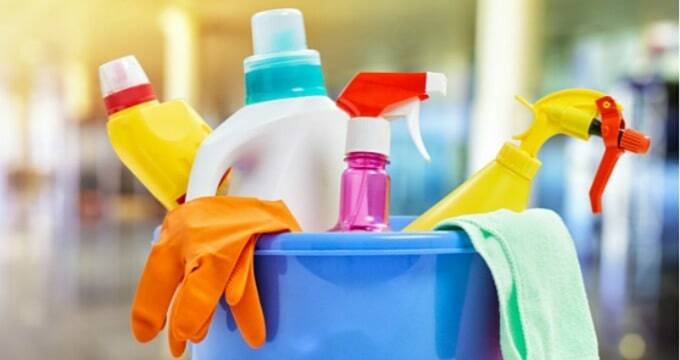 Here’s another promise: once you make this daily cleaning routine a habit your home will always look clean, even when you haven’t had time to do a thorough job. So if that first couple of days seem like a slog, remember this: you will never have to cringe or apologize for the state of your home when someone drops by after this becomes a habit. Make your bed every morning. A rumpled bed will make even the cleanest rooms look like a disaster. Pick up all clothing. Clean stuff gets folded or hung, dirty stuff goes in the hamper. Put away jewelry, hand lotion and other items on the nightstand. Check the floor. Vacuum or dry mop high-traffic area as needed. Wipe the sink basin clean after you’ve used it. Buff water spots from mirror and faucet. Wipe the toilet seat and rim with a disinfecting cloth. Spray the shower, tub and shower door/curtain with homemade daily shower spray. Replace any makeup-stained towels or washcloths with clean ones. Check the floor. Sweep or dust mop as needed. Empty the dishwasher if it’s full. Empty the sink of any dirty dishes, and give the sink a quick scrub. Get your kitchen sponge wet and microwave it for 2 minutes. Spray and wipe down counters and appliance fronts. Corral any clutter into a neat pile to deal with later in the day. Use a damp microfiber cloth to wipe up any splatters on the floor. Toss the dirty dishtowel in the wash, and put out a clean one. Give the floor a quick sweep. Straighten all pillows and blankets on the sofa, which is one of the room’s major focal points. Neaten magazines, books, games, and DVDs that are sitting out. Wipe away any obvious crumbs and fingerprints from table tops. Check the floor. Use a carpet sweeper or hand vacuum to pick up any messes from floor. I use the following cleaning tools for my Daily Cleaning Routine and wholeheartedly recommend them. To see other equipment I use, check out my Recommended Products page. Click the photo above to open a .pdf file for printing. Want to get your home truly clean and organized? 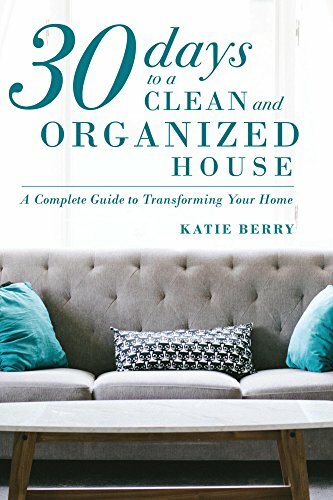 Pick up a copy of my book, 30 Days to a Clean and Organized House. 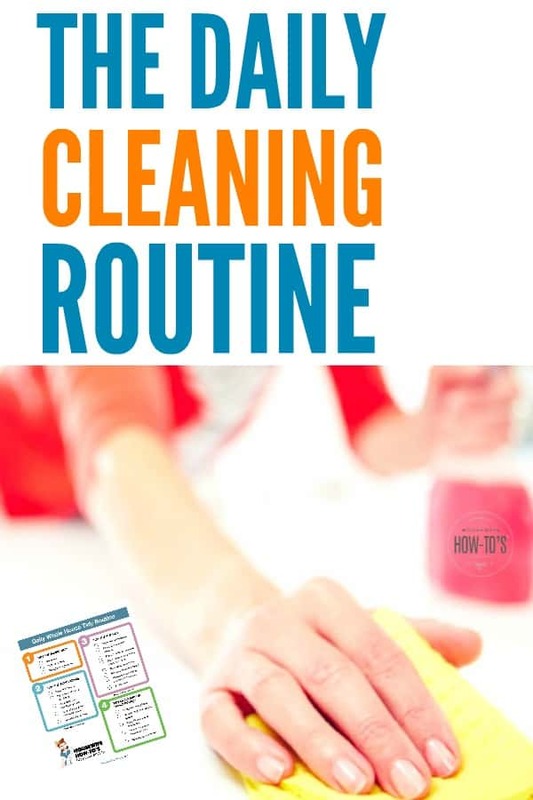 With daily step-by-step plans, checklists, and a dozen homemade cleaning mix recipes, you can get your home spotless on your schedule! You can use ‘diatomaceous earth for bugs and slugs. I am wondering if that DIY ball is safe to use as I have cockatiel birds. What if they crawl all over their food? It’s impossible to keep their cage clean. I haven’t seen any in there. But at one apt. complex, sadly, my cockatiel bird died and looked like she was poisoned. They used gel w/peanut butter. That stuff was suppose to be a slower killer and they crawl all over the place with the gel plus didn’t work. When they replaced the bathroom baseboard heater, that was the end of the cockroaches. So I am a firm believer of sealing up every crook and nanny! Here’s the thing: so long as we know where we want to go, and we accept that we might have to take baby steps getting there, we will! Don’t give up, my dear. Don’t push yourself too hard, but don’t give up. You say it’s by the Grace of God that you found my website, but I will tell you that same Grace led you to leave a comment that truly blessed my evening. So what if it takes you 365 days to do that 30-day plan? You are still doing things! You are still moving forward! You still have a goal, and the ability to work toward it! I imagine at one point following your head injury you didn’t think you’d be able to do what you’re doing these days. So, you see, you’ve come a long way and you’re doing wonderfully. Take heart and take care. Both of these comments are so sweet to read. I will continue the use of this lovely woman’s site and will be investigating her books. How divine to read such a lovely back and forth. God blesd. Lee, I think anyone in your situation would be feeling the blues. How awful that you had to fire the contractors! I’m glad you’re feeling motivated to get life back on track, though. That’s resilient! Take things slow so you don’t burn out, and at the end of every day be sure to make a mental note of three things you’ve improved so you KNOW you’re making headway. Best of luck to you! 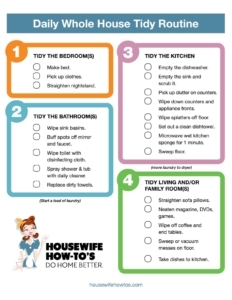 Just found your site and out of all the “cleaning schedules” I have looked up and tried to use, these seem to be the most fun and planned out. I love the flow charts and it gives a clear start and finish vs. just do this and this and this with little to no direction. I do have a question….why microwave the wet sponge? Thank you for the kind words, Leah! I like flow charts because, as you pointed out, they have a clear-cut start and finish. Without them, I feel like my work for the day is never really done. As for microwaving the sponge: those things are scary bacteria factories. If they’re not cared for properly, they can breed e. Coli and other things that we’re trying to get rid of. Microwaving a sponge sterilizes it and kills off those nasty bugs. Just be sure it’s soaking wet or you’ll start a fire! Thanks for the tip on sponges. I never really knew how to maintain them before, but I’m going to start microwaving them now! I for one appreciate the info on cockroaches. My husband and I recently moved into an apartment that was infested and since we had nowhere else to go this info helped tremendously. I think maybe you could overlook the tiny pic. It sounds like you just want to complain. Please take that disgusting cockroach graphic off the righthand side of this page. It’s on several pages that you have here, and it does make me not want to come back. I’ll probably have to look for my natural cleaning tips elsewhere, because who wants to keep seeing that ugly thing over and over? Not me. That is for information, and how to’s. It lets people know what ideas and products work here. If the dead cockroach were alive, then I’d know it didn’t kill him…right? Frankly, if you’re so squeamish that a mere photo of a dead cockroach prompts you to such fits of pique that you feel compelled to leave not one, not two, but three — THREE — comments of complaint (when you’ve never visited nor commented here before), then you’re welcome to find your natural cleaning tips elsewhere. Thank you so much for making these kinds of things available for print. They have been really useful for me. It challenges me to clean things I pay little attention to, like “Vacuum under the bed” with the hose which has never crossed my mind and helps me actually sleep better since I’ve started using your charts. And because I’m so ADD, these act as an anchor for me and cleaning so I actually get a room clean all the way. In addition, I made an organizational notebook for my mom and best friend last year using these and they love them! I am a big fan of the checklists too! Thanks for posting them. It is always nice to get someone else’s perspective on what is important to add to the cleaning routine. I am prone to missing stuff so this list is helpful! I like your article on daily routine very much. It really appreciated me and make my own daily schedule to make my home neat and tidy. thanks for sharing your views……….